True or False: A crown can address a number of oral health concerns. True or False: They are made from a number of different materials. True or False: Placement takes about two visits. True or False: They are easy to maintain. True. We can place them to fix a chipped, broken, or fractured tooth. We can also use them to repair decayed teeth or help teeth that have become infected to abscessed. They can reshape malformed teeth and also anchor dental bridges in place. Finally, we can place them to restore a single tooth dental implant. True. 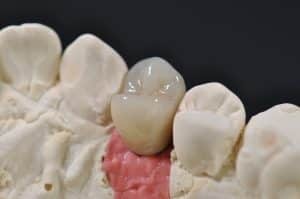 For teeth near the back of the mouth, which must endure more serious bite forces, we can place metal, zironcia, or porcelain-fused-to-metal. We can use ceramic for the teeth near the front of the mouth, due to the material’s lifelike appearance and the ability to be color-matched to blend with the rest of the smile. True. The first visit involves preparation. We will remove a small amount of tooth structure and take detailed impressions. In between the visits, the restoration will be created at a dental lab. When the patient returns for the second visit, we will place the restoration with a powerful bonding agent. True. Keeping them strong means protecting them from plaque buildup and other issues that can endanger a restoration. You should be sure to brush your teeth twice a day, floss every night, and have your teeth (crown included) cleaned every six months at our office. Does Your Smile Need a Restoration? If you have a damaged tooth, or a serious oral health concern, then talk to our team today. We can provide a custom-made restoration to improve your smile. Get the information and treatment you need in Celina, TX by contacting Celina Family Dentistry to schedule a visit today at (214) 851-0130.